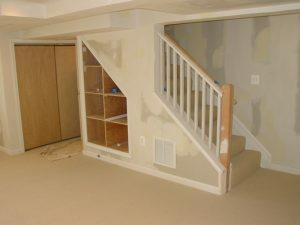 Are you thinking about finishing your basement? If so, you may have pondered the age old question whether or not to remove the door at the bottom of the stairs. The door is typically added as a code requirement to separate the finished from the unfinished space. About 50% of our homeowners choose to keep the door because it serves to help minimize the passage of sound & or air flow from the downstairs to the upstairs. Usually these homeowners have children or pets that they are keen to contain physically, so the door certainly serves that purpose. Some homeowners also believe that they will save some money by not tweaking or adjusting the wall because it is often load bearing. That is sometimes true depending on the contractor, but in the grand scheme of things I think the additional cost is negligible. The other 50% opt for aesthetic appeal & choose to remove the door and open up the stairwell so that their home has better flow from the upstairs to the downstairs. It is the age old question, form vs function; aesthetics vs functionality. There are various ways of opening it up of course. If the stairwell wall is load bearing, we will often install a glue-lam beam in order to open it up. We can install a railing (more expensive) or we can do a half wall (slightly less expensive). Another consideration is opening up the stairwell up to & including the third stair. The international building code says that you can open the stairwell to the third stair without a railing as long as you have a continuous handrail on the opposite side. Opening to the third stair will likely make it easier to get furniture in & out of your basement so that could prove to be a tipping point. Whatever you end up deciding, make sure you are fully informed & discuss your options with a designer or a contractor. If you are in the Salt Lake valley & you’d like some input, reach out to me. I’m happy to make it happen.